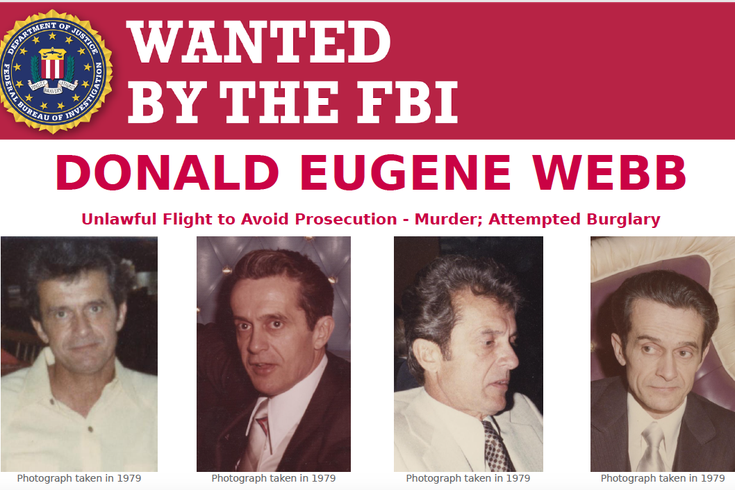 An updated wanted poster for Donald Eugene Webb. Decades after Donald Eugene Webb — a "career criminal" who authorities describe as a "flashy dresser" and a "big tipper" — allegedly killed a Pennsylvania police chief during a traffic stop, the FBI has released new photos of Webb in hopes of locating him. Federal authorities are so keen on closing the case they're offering a $100,000 reward for information on Webb's whereabouts — even if it is just his remains. Webb had already been involved in criminal activity for nearly 50 years, specializing in jewelry store robberies, when Saxonburg Police Chief Gregory Adams pulled him over during a routine stop on Dec. 8, 1980. Webb allegedly beat and shot Adams. At the time, it was the first murder in the Butler County town's 167-year-old history. Currently, Webb is the only man wanted by the FBI for killing a police chief. Agents found Webb's car in a Rhode Island parking lot with blood in it linked to Webb, suggesting he fled to the area near his home in southern Massachusetts and that he was injured in the encounter with Adams. At the time of the alleged murder, Webb already was wanted by the feds for a jewelry store burglary in Albany, New York, and had been residing in eastern Pennsylvania motels under the alias Stanley Portas — the name of his wife's deceased husband. Before he was pulled over in Saxonburg, he had told associates he was not going back to prison, according to the FBI. Webb, who associated with a group connected to Providence's Patriarca crime family, was put on the FBI's “Ten Most Wanted Fugitives" list in 1981 but was removed in 2007. Most of the new photos of Webb were taken on a cruise with his wife in the summer of 1979. At the time he fled, Webb was described as having brown eyes, standing 5 feet 9 inches tall and weighing about 165 pounds. He may have a scar on his right cheek and right forearm, and he may have the name "DON" tattooed on the web of his right hand and "ANN" on his chest. If alive, he would now be 85 years old. "We’re in the final stages of this investigation, and given Mr. Webb’s age, we’re doing everything we can to bring some closure to Chief Adams’ family and the citizens of Saxonburg," said Harold H. Shaw, special agent in charge of the FBI's Boston Division. Anyone with information is asked to call (800)-CALL-FBI (800-225-5324).